Like lion tracks, you could probably find them on the vast plains of southern Africa if you knew how to look for them. Unlike their big game counterpart, however, ion tracks tend to attract physicists rather than wildlife photographers. Ion tracks are in fact the minute and almost undetectable trails left behind by high-velocity heavy ions (‘swift heavy ions’) such as uranium and gold when they pass through materials such as silica (SiO2). Patrick Kluth from the Australian National University says ion tracks have many different applications, particularly in materials science and engineering, geology and physics research. For example, they are useful for dating ancient geological samples and archaeological artefacts, testing storage materials for immobilising nuclear waste, protecting aerospace equipment from damage in interplanetary space, and developing new nanofabrication techniques. High-energy ions rarely collide with atomic nuclei on their way through a material but they lose energy in their very brief encounters with electrons. This can create narrow damage trails around the ion trajectory: the ion tracks. Ion tracks are only a few nanometres wide but can be hundreds of micrometres long, and their extremely high aspect ratios are of interest for materials engineering. However, the mechanisms of ion track formation are not fully understood because ab initio modelling of the highly non-equilibrium processes involved is extremely difficult. 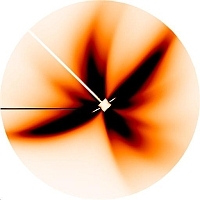 The current understanding is that the target material is heated to extremely high temperatures around the ion trajectory, leading to localised melting and damage in the atomic lattice. Patrick and his colleagues are using small angle x-ray scattering on the SAXS beamline at the Australian Synchrotron to investigate the formation of ion tracks. They are measuring track diameters and investigating how the density of the material changes with distance from the centre of the track. Patrick’s interest in ion tracks stems from his background in nanofabrication. Ion tracks can be used as templates for producing rows of nanowires, or as single pores for filtering or sensing particular biological molecules. Patrick and his colleagues pIan to expand their study to a variety of materials including real geological samples and investigate the behaviour of ion tracks under high pressure. They also want to look into the recovery dynamics of ion tracks under heat treatment, an objective that is well-suited to the capabilities of the new Pilatus detector on the SAXS beamline at the Australian Synchrotron. Patrick Kluth and ANU colleagues with the SAXS beamline team on 13 August 2009, 12 months to the day since the beamline achieved first light. L to R: Adrian Hawley (AS), Stephen Mudie (AS), Patrick Kluth (ANU), Nigel Kirby (AS), Boshra Afra (ANU) and Matias Rodriguez (ANU).